The Xamarin.Forms Diagram control allows users to quickly to create, visualize and edit interactive diagrams within your Xamarin applications. It supports creating flowchart, organizational charts, mind maps, use case diagrams and more. The Xamarin Diagram control allows users to quickly to create, visualize and edit interactive diagrams within your Xamarin applications. It supports creating flowchart, organizational charts, mind maps, use case diagrams and more. Built-in automatic layout algorithm specifically made for organizational charts, making it as easy to arrange the parent and child node positions automatically. The Xamarin Diagram control provides built-in automatic layout algorithm specifically made for mind map diagram which allows you to define which topic should be at the center and which sub-topics should be placed around the center topic in the diagram surface. 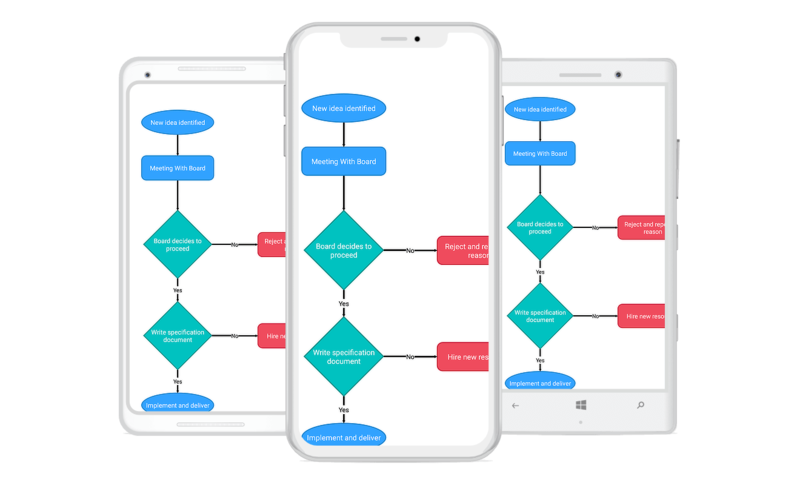 The Xamarin Diagram control provides standard flowchart shapes as ready-made objects to build flowcharts, making it is easy to add them to a diagram surface in a single call. There are three types of connectors available in the diagram which are straight, orthogonal, and curved connector. Bridging clearly indicates a connector's route and makes it easier to read where connectors overlap each other in a dense diagram. Use decorators and arrows to indicate flow direction in flow charts or state diagrams. Interactive features are used to improve the runtime editing experience of a diagram. You can easily edit a diagram with touch and move on the surface of the diagram. Select a node or connector or annotation and edit them using thumbs or handlers. Stencil includes a gallery of stencils, reusable symbols, and nodes that can be dragged onto the surface of a diagram. You can easily export the diagram in PNG and JPEG image file formats.